Two big, highly anticipated albums hit the ground today and what am I doing? Why I'm posting another obscure record authored by the enigmatic group Circle of Ouroborus ,who I'm beginning to fall in love with. And I still haven't gotten through the majority of their discography. It's increasingly difficult to keep up with the amount of material these guys put out there, and even more difficult to procure physical copies of it due to the high demand and limited releases. Since Eleven Fingers last year there have been 9 new records from this Finish duo (most cassette or vinyl only releases), and I only managed to get a hold of 3 of them including this one. Abrahadabra was recorded around the same time as Eleven Fingers and The Lost Entrance of the Just so you can expect a similar murky production, clean mournful howling vocals, astral/existential/contemplative and somewhat depressing lyrics in their simple rhyme scheme, and dream-like guitar tones through listless riffs and structures. You have six tracks to get lost in here, the last one is nearly 10 minutes. Overall this is a much slower record (especially on side two) with no hoarse black metal growls to balance out the clean style. The first side is generally more mid-paced, the cloudy blackened post-punk is still quirky yet catchy and ghostly, and a few rhythms with slightly awkward percussion. You can hear a little of this on the opener "Conspiracy" during the hook where it speeds up, the escalating notes here giving of that ethereal vibe. "These Days And Years To Kill" has a couple moments resembling traditional black metal in the backing riffs but still not near their effort on "Armon Keitaalla". The second side begins with a slow track "Six Hands" which reminds me of "Sigil of Suns": melancholic riffs whining like a synth with a slower rhythm behind it, the drumming picking up only briefly at points. And it continues like this with "Like Silent Meadows", swaying in a very fantasy-ish manner. The closer as mentioned is a long one, slow with short episodes of martial drumming (much like in "Breathing Slowly") alongside the pinging cymbals. It has a a great section like 3 minutes in once the vocals drop out where both the lead and rhythms are quite beautiful (and repeats quite often). It might be my favorite track and is the most reminiscent of material on "Eleven Fingers". While it's not as wonderful straight across the board as Eleven Fingers it is more engaging and memorable (for me at least) than The Lost Entrance of the Just. 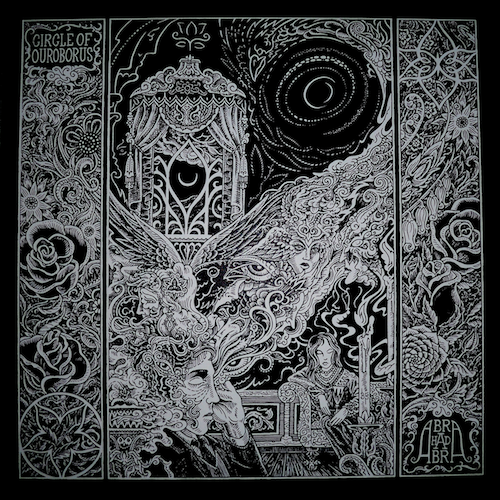 Though I've seen some people bagging the drumming on recent Circle of Ouroborus records I like it a lot. Sure it's simple and doesn't vary a whole lot (maybe a little more varied here) but it stands out making the songs more hypnotic. I certainly recommend checking this one out if you've enjoyed their recent style. If you're interested in a copy you'll have to do some in-depth searching, but you can also head over to Fallen Empire Records and shoot them an email asking for a copy. I grabbed mine from them just before they ran out but they're trying to get more in stock for now. nice dude. Never cared for this band until I heard Eleven Fingers, which I liked quite a bit. They're one of those bands that I wish would work a little harder on releases and not just put out everything they record. So apparently nobody told them that Dimmu Burger already released an album with this name... how droll. I'm great man, been a little less active here than usual but hopefully that will change. Of course I remember and I would be happy to link you on the sidebar and get the word out. Consider it done, and best of luck with the new blog!